So, you joined the cool kids club and bought a Mac. Kudos! Now, do you dare admit to your sophisticated Mac mates that you still need some help figuring out how it works? 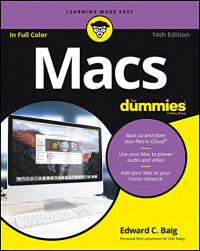 No worries, Macs For Dummies is here to help! In full color for the first time ever, the latest edition of this long-running bestseller takes the guesswork out of working with your new Mac, providing easy-to-follow, plain-English answers to every possible question in the book! Whether you're trying to figure out the basics of getting around the OS X interface, learning the ins and outs of turning your Mac into a sleek productivity tool, or anything in between, Mac For Dummies makes it fast and easy to navigate your way around your new Apple computer. You'll get the know-how to rocket into cyberspace, browse the Web, send messages, back up files to the Cloud, deal with security issues, get productive with leading Mac apps, and have fun with one-stop shopping for music, movies, and media. Fully updated to cover the latest hardware and software releases, Macs For Dummies offers everything you need to get your geek on—and make your Mac your minion. This book offers non-academic, real-world approaches to implementing CMMI-based process improvement in an organization. The author identifies critical concepts of CMMI, and details how to turn them into real process improvement. This casebook is intended as a supplement to any primary auditing text, as it helps extend and focus classroom discussions on the impact of Sarbanes-Oxley. It grabs student interest by providing engaging, real-world examples of the auditing environment pre- and post-Sarbanes-Oxley. The indispensable guide to writing clean CE applications, including real-world tips, techniques, and workarounds. This hands-on, concise guide gives you 24 proven techniques for communicating clearly and managing conflicts. It features guidelines for everything from sharing information and gathering input from employees to handling disagreements to conducting results-driven meetings and presentations.